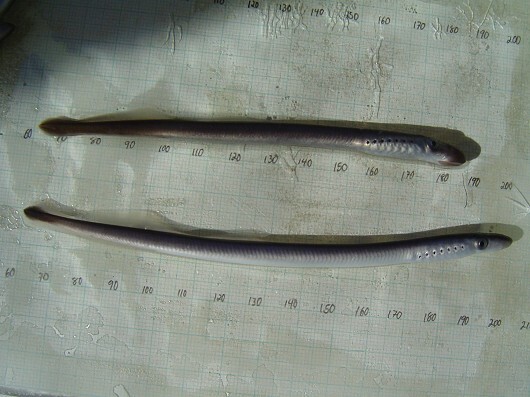 River lamprey, captured in rotary screw trap on Sacramento River at Knight's Landing. Photo by Dan Worth, California Department of Fish and Game. The life history of river lampreys is not fully understood and any studies were documented in British Columbia where the life pattern and timing of events might differ from California and the southern reaches of distribution. River lampreys are anadromous and they live a predaceous life when in the ocean. Larval lampreys or ammocoetes probably spend the first 3-5 years within a freshwater stream. Ammocoetes burrow themselves tail-first into the soft substrate of a backwater where they feed on drifting matter such as algae and microorganisms. When the ammocoetes reach around 12 cm TL and several years of age they begin to transform into adults during the summer. Metamorphosis takes 9-10 months, which is the longest transition of all the lampreys. Before river lampreys have completed the change they assemble at the mouth of the river, finally entering the ocean in late spring. River lampreys are believed to spend only 3-4 months at sea where they grow rapidly by attaching to fish such as salmon and herring and feeding on muscle tissue. The voracious lampreys may kill the prey though feeding continues even after death. In the fall of the same year the river lampreys return to their natal streams and spawn from February to May. During the last part of their life the lampreys actually shrink up to 20% in length. Spawners dig nests or depressions in gravel where a female lays her eggs. Fecundity is not well recorded, but egg production was estimated in one stream to be 11,400-37,300 eggs per female.